The house is accessed through 3 doors, the common courtyard opening onto an entrance and, from the street, either onto the kitchen or onto a 2nd entrance. 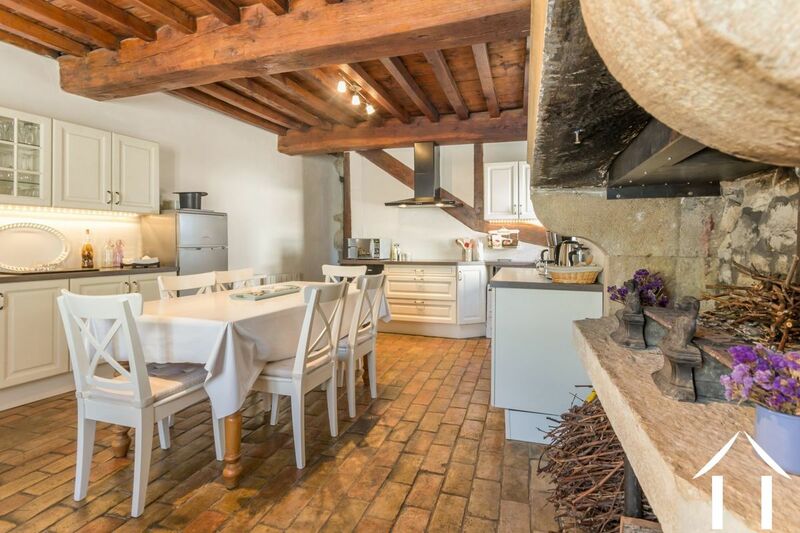 The well-equipped kitchen is spacious and offers a comfortable and pleasant living space for family meals or with friends. It is good to live in this very bright space facing due south, with its large fireplace for winter flames; on the floor warm coloured bricks, on the ceiling beautiful exposed beams. 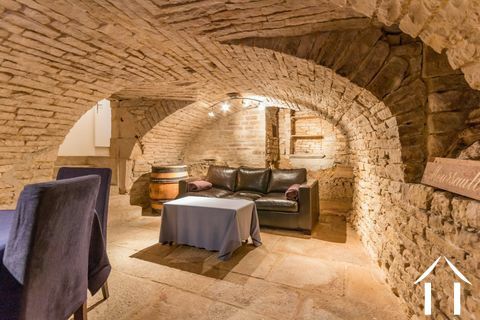 At the end, a toilet followed by stairs on the left that lead down to one of the entrances and lead to a cellar currently used as a living room, with beautiful Burgundian slabs on the ground and a vaulted ceiling made of exposed stone. On the right the other entrance leads to the small terrace area. 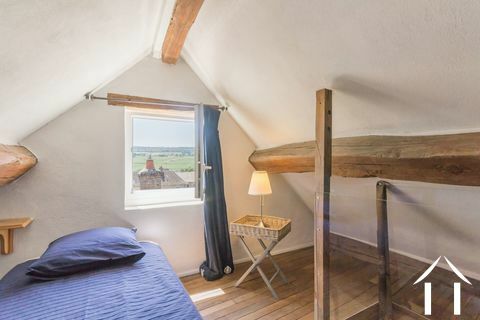 From there a staircase leads to the first bedroom with fireplace, French ceiling painted white, floor tiles and a small corner with oak floor. 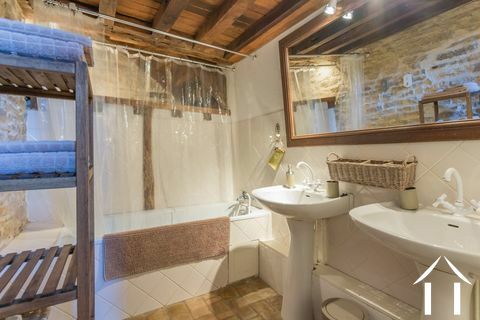 A few steps lead down to a bathroom with sink. 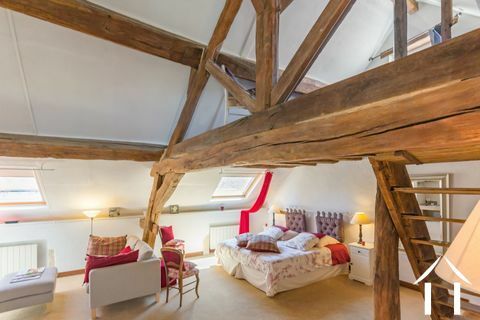 This beautiful room could be transformed into a living room, if we wanted to keep the cellar for the wine. 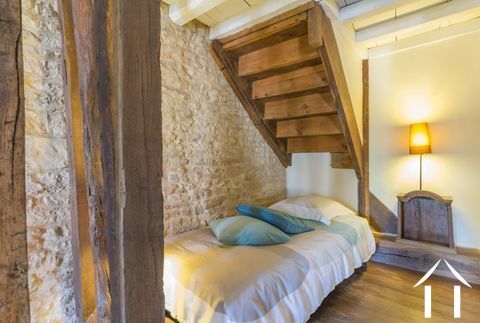 On the landing, the staircase continues towards a bedroom under the rafters, with an ensuite bathroom with 2 washbasins as well as a separate toilet, a charming mezzanine closed by plexiglass, a large fireplace and many velux windows bringing a lot of light. From the mezzanine there is a very beautiful view of the vineyards. 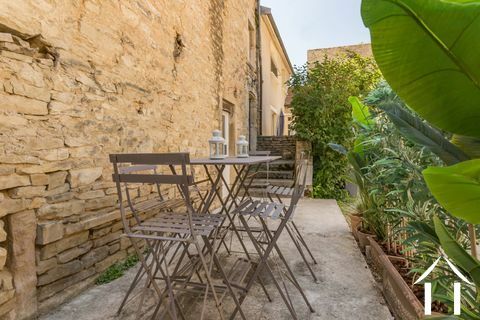 The communal courtyard has been "divided" into small spaces so that each owner can enjoy their own terrace to enjoy the outdoors. 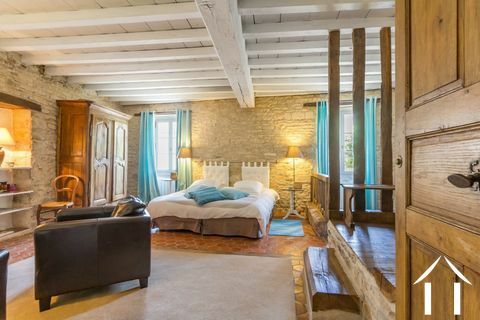 This charming property offers a pied à terre in a prestigious village, or can continue as a gîte well appreciated by its visitors.